A Palestinian terrorist stabbed and killed an American tourist and injured at least 10 others in Tel Aviv on Tuesday, marking the third Palestinian attack within hours of one another. 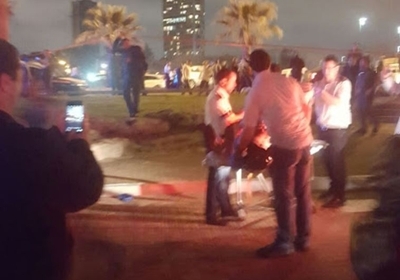 Israeli police said the terrorist started to stab civilians near the entrance to the Jaffa Port entrance – wounding multiple individuals – before escaping toward Tel Aviv and stabbing motorists idling in their vehicles on the road. Four of the victims are in serious condition, including a pregnant woman. "Terrorist acts against children, women, and innocent people are intolerable," said Biden in a joint press conference with Peres. Hours earlier, Palestinian terrorists stabbed and injured three Israelis in two separate, nearly simultaneous attacks. In Petah Tikva, a Palestinian terrorist repeatedly stabbed a 40 year-old ultra-Orthodox Israeli man in a wine store. After fleeing the scene temporarily, the victim returned to the store, pulled the knife out of his own neck and mortally stabbed the terrorist. Around the same time, a Palestinian terrorist shot two Border Police officers in the head outside Nablus Gate in eastern Jerusalem. The two police officers are in critical and serious condition. Israeli police chased down and neutralized the gun-wielding assailant. Earlier on Tuesday morning, an Arab woman in her 50s attempted to stab a Border Police officer in the Old City. The terrorist was shot dead on the scene. Hamas praised Tuesday's attacks and said that Israel's attempts at stifling the violence are failing. Israeli security forces believe Tuesday's attacks are not related and indicative of the Palestinian terrorism wave throughout the past five months that has claimed the lives of 34 Israelis. The attacks have been largely characterized as individual initiatives, fueled by ongoing Palestinian incitement from social media circles and across the political spectrum. Though most attacks are not attributed to any particular terrorist organization, official representatives of Hamas, Fatah and the Palestinian Authority (PA) glorify the murder of Israelis and encourage other Palestinians to emulate the terrorists. For example, Fatah – the party of PA President Mahmoud Abbas – called for killing Israelis throughout the entire country in a music video broadcast on Fatah's Awdah TV channel in January. In February, senior Fatah official Sultan Abu al-Einein praised two teenaged terrorists and called them leaders for stabbing Israelis and killing a 21-year-old off-duty soldier. Notable Fatah and PA officials have repeatedly expressed support for Palestinian terrorists who attack Israelis by glorifying their images in official media outlets, attending government-sponsored funerals of terrorists and providing financial assistance to their families. Joe Biden is a puppet of Barack Hussein Obama. Obama embraces Palestine and loathes Israel. What ever words Biden has to say are meaningless. 1. That's nice. I wonder if he sees any connection between the Obama policy towards Israel and Netanyahu and these attacks. Obama has made it clear that America is less interested than ever in supporting Israel. He thinks that the two sides are morally equal: the one that refuses to recognize an extant state because (and only because ) it is not a Muslim state, and the one legitimate extant state that seeks to live in peace with a Palestinian state that also seeks to live in permanent peace. 2. Why can't Biden have condemned terrorist attacks against "children, women and men"? Are men somehow less " innocent " in a nation that conscripts both sexes? 3. Has Biden condemned either Hamas or the party of PA President Mahoud Abbas, or merely "terrorists"? 4. Who does he think he's kidding? I noticed that all the perpetrators are described as being Palestinians. Are not some of them possibly Muslim Israeli citizens fighting for the Palestinian cause?